Put sugar and water in a pan. 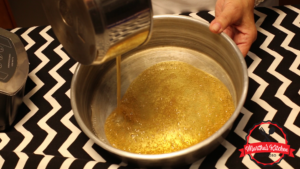 Cook over medium heat until it turns to a golden caramel. 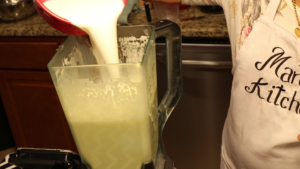 Blend the eggs for 4 minutes. Add the dulce de leche, vanilla and milk. Blend until all the ingredients are mixed. Add the caramel to a round baking pan and spread all over the mold. 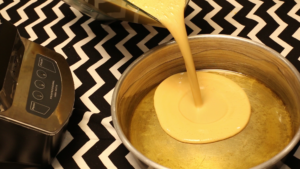 Pour the mixture over the caramel. Cover with aluminum foil. 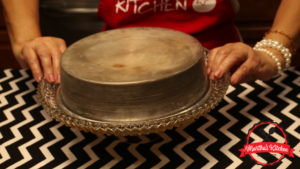 Add water to a larger baking pan, and place the flan inside the large pan. Bake at 350° F in a “Bain-Marie” for 1 hour. 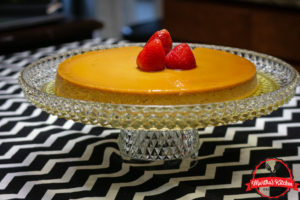 Uncover and check with a knife if the flan is ready (if the knife comes out clean it is because it is already). Rest for 1 hour or until the flan is cold. Flip over the flan and add the leftover caramel on top.